Because horses are flight animals, when they get involved in accidents they often worsen the situation and increase the damage that is done because of their frantic attempts to flee. Every veterinarian who does horse practice is familiar with this fact and has often horrifying stories to illustrate it. So, during the course of my practice careers, I recall the gentle older gelding kept in a large pasture. He had experienced all kinds of scary things in his life; wildlife, highway traffic, noisy machines, all kinds of farm animals, gunfire, migrating flocks of geese, noisy people and so on. But, on the day a hot air balloon landed in his pasture he freaked out, stampeded through the barbed wired fence, lacerating himself badly. I also remember the horse that was frightened after loading into a trailer. He tried to jump out of the front window, stuck both forelegs through the shattered glass, lacerating both legs. Trailer accidents are all too common. I remember two cases where horses traveling down the road stuck their heads out of the trailer side windows, until a vehicle coming from the other direction hit the protruding heads, killing the horses. Be sure horses being hauled cannot stick their heads out of the sides of trailers. Once, a horse got loose in the adjacent town of Moorpark and was struck by an automobile. Both of the horse’s forelegs went through the windshield. A foot went on either side of the driver’s head. Fortunately, the driver, an elderly lady, escaped injury. The horse also survived minor injuries caused by the broken windshield. I have been called to see horses seriously injured when a trailer floor collapsed on the highway and a horse’s foot was abraded by the pavement, because the driver was unaware of what had happened and kept on driving. In one case the hoof had been ground off including the coffin bone inside the foot. Mountain lions inhabit the area in which I live and I warned a neighbor that their small herd of miniature donkeys should be kept in an enclosure with a lion proof fence. The mountain lion’s primary game in the wild is deer. So they may instinctively attack any deer-sized creature such as a pony, a human kneeling or bending over, or a goat or a sheep, or other deer-sized creature. Then, it happened. I was called to see one of the donkey’s, which had been attacked by a mountain lion. The little donkey’s neck had deep bite marks. It’s back was raked with claw marks. But, it survived, because it was a donkey and not a deer. I’ll bet that it had kicked the heck out of that cat, until it was forced to release the donkey. Once I was called to see a horse that had crashed through a plank cover over a well. The horse was upside down in the well, was breathing normally and had quit struggling by the time I arrived. I was pessimistic about the horse’s chance to survive. After all, it had gone down to the water level, 20 or 30 feet below. It was lying there, all twisted up. I went down into the well on a rope ladder, sedated the horse with an I.V. injection, passed a rope hitch around its forequarters and haltered it with a 35-foot lead rope. Then a crane was used to bring the horse back up out of the well. Despite my pessimistic prognosis the horse eventually got to its feet and it survived the accident. I had the weekend off once in December. I had been nursing a cold and looked forward to a restful couple of days at home. So, I was napping in front of the fireplace when a neighboring lady knocked frantically at our door. At the time we were living in a home we had built, in a horse zoned subdivision. Our property was bordered at the back by a steep short canyon we all called “The Arroyo”. In it a stream meandered, just a few inches deep most of the year, but during the rainy season it became a roaring torrent. This was back in the 1960s, wet years, and in some areas dangerous quicksand developed after a few weeks of winter rain. I dressed up, put on rubber boots and walked and slid down, past my barn, to the stream below. The would be rescuers had a halter on the mare and were futilely pulling on it. Only the mare’s neck and head were exposed. The rest of her was submerged in the quicksand. I quickly assessed the situation and told the folks we had to get a tractor as quickly as possible in order to pull the mare up onto safe ground. They said they had already requested one from the large Standardbred ranch, which neighbored my property. The arroyo formed a boundary between my small place and their huge facility. So! A tractor was on its way. But the poor mare was sinking deeper as we watched. I had brought a forty-foot lariat down with me. I knew that if the tractor pulled her out with the halter, there was a risk of serious injury to her head, neck or cervical spine. Therefore I decided to try to get my long rope around her body, behind her forelegs. In order to do this I had to get into the stream. My rubber boots immediately filled with water and I couldn’t move. I was trapped in the quicksand along with the mare. So, I pulled my feet out of the boots, which were never seen again (the boots, not my feet) and in the ice-cold water I dunked down and struggled to get the rope around the mare’s body. One of the neighbors ducked under and caught the rope on the opposite side. The results: The mare survived, but I had to treat her for hypothermia, shock, and exhaustion. I got pneumonia and for decades, if I caught a cold I would end up with bronchitis. I thought that the mare should somehow have realized the presence of quicksand and chosen a safer place to cross the stream. However, many years later I made the same mistake, in our next canyon home. Sally, a mule out of a Tennessee Walking mare became a beloved member of our family. We kept her, rode her, and successfully showed her until she passed on at 34 years of age. But, to get back to the quicksand, in order to get home I asked her to cross a creek normally about 6 or 8 inches deep and only about 3 or 4 feet wide. However, due to the exceptionally wet winter, the creek was twice as wide and, I assumed, twice as deep. “No!” She insisted. So I forced her to cross. Down she went into quicksand. Her chest was buried. I bailed off, quickly realized that she was hopelessly stuck, and sinking. What to do? These were the days before cell phones and there was never mid-day traffic in our dead end canyon. 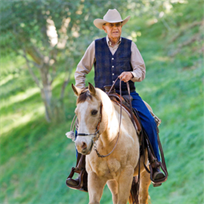 I cut the latigo holding my saddle in place with my pocketknife. Sally was on her right side, the saddle submerged. I left her there and jogged home hoping I could get back in time to save her before she drowned, using my tractor to pull her out of the quicksand. Halfway home, here came a fire engine surveying the winter grass growth, anticipating a serious fire season at the end of the summer. I waved them down, quickly explained the urgency of the situation, told them that the three firefighters on board, plus me, could pull Sally out of the quicksand. “No. I’ll run ahead of you. It’s just a few hundred yards up ahead.” I said and broke into a run back to Sally. I heard the fire truck start following me. Yes, it was. Sally, covered in mud, had somehow gotten out of the spot she was stuck in, and was grazing up on the dry hillside. My saddle was completely submerged. When I went to recover it, I examined the location and was able to understand what had happened. Sally was stuck in the stream, head downhill. When I left her only her head and her neck were out of the muck. She didn’t realize that I had cut the latigo holding my saddle on. So she chewed the latigo in half at a high point, where it was just an inch or so under the surface. That mule understood that she was trapped and could not save herself unless she got rid of that saddle. Then, free of the saddle, she rotated herself 180 degrees, on her side, in the quicksand. Now she was able to get her forelegs up on the bank, which was lower than the opposite bank where she was trapped. The tracks told the whole story. With her forefeet on a solid bank, she was able to drag herself up and leave the stream. Streams easily crossed most years can become treacherous beds of quicksand in wet years. Mules are infinitely more intelligent than I realized. 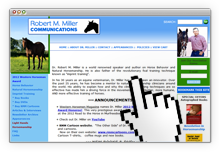 I have described some examples of unusual accidents, which injured horses during my practice career. For example, the gentle older gelding who ran through a barbed wire fence when a hot air balloon with several people aboard, landed in his pasture. Or, there was the mare who crossed a familiar stream during a wet rainy season and got stuck in quicksand, as did one of my mules. However, it is human error that has caused injury and / or death to thousands of my equine patients. Nails! They didn’t exist in the natural environment in which the horse evolved. They are a manmade civilized invention. They cripple and kill countless horses. It’s not only loose or spilled nails that are the problem. After many years nails often work their way out of old fences or boards and end up in hooves. Be aware! Unlatched feed rooms or feed containers, especially grain. How many foundered or colicky horses have I seen because someone left a door unlatched, or because a horse learned how to unlatch a door. This is the reason every barn door on my ranch, every stall door, every pasture gate has two latches. It might be a snap hook to secure the latch, or a chain to doubly secure a gate, in addition to the latch, or even a twisted wire. I insist that every time a door or gate is closed, that both closure methods be used. I have seen too many tragedies! Horses turned into green succulent pastures when they have been on dry feed often founder or get serious colics. Having seen so many of the painful avoidable tragedies, I am somewhat paranoid about introducing equines to green forage. I give them five minutes the first day, and then very gradually increase the grazing time up to an hour. Then I increase the time very gradually, 15 minutes at a time, up to three or four hours, then a half day, and then, finally, up to full time. I have never had one of my own equines founder, or colic.